The first time I bought ground turkey at Costco I was confident that I would come up with lots of interesting ways to use it. Turns out turkey burgers was about as far as I got until I ran across this gem in Fine Cooking magazine. Its a great weeknight dinner and has the requisite carbs/meat/veggie combo I like so much. It may be a little light on the veggie side so if you want to make it more balanced I would recommend serving it with some spinach sautéed with garlic and ginger for good measure. It reheats well so make the full recipe even if just for two and you will have some lunches ready to go as well. I know not everyone is super comfortable with Indian food but this is a terrific gateway meal – it is not spicy in a hot sense but it does have great flavor from the spices you are cooking with. 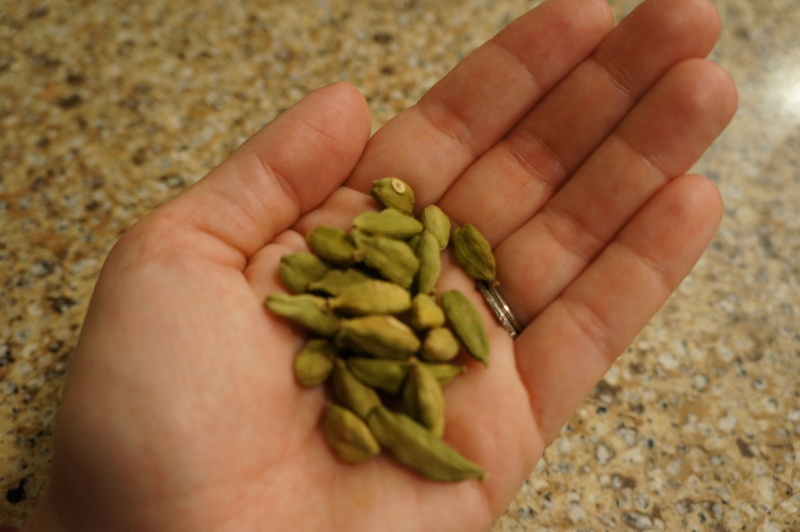 It’s worth it to go out and get cardamom pods, whole cloves and cinnamon sticks. 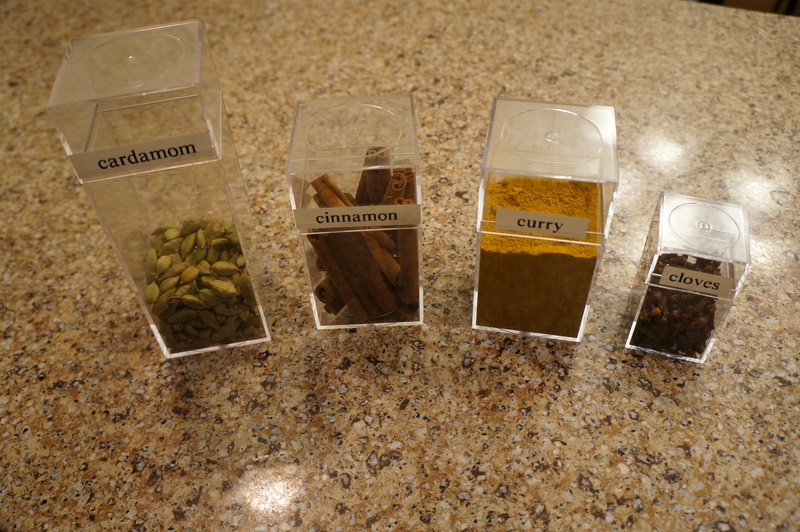 If you were to use ground versions of any of these the taste wouldn’t be as subtle and complex. You can find all of these pretty easily these days – I like World Market for this as they sell pretty small sizes and the spices last up to a year. Hopefully having them on hand will encourage you to try out more Indian dishes but if not they are also great in mulled cider or wine in the fall. 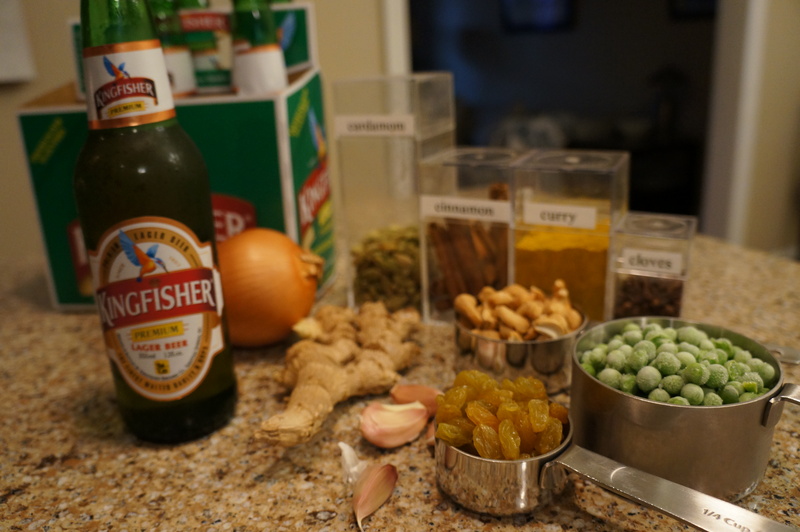 I increased the amount of curry powder for a bit more punch – and just as important as having the right spices is also to have a Taj Mahal or Kingfisher to drink with the biryani! In a large pot that has a lid, melt 1 tablespoon of butter over medium high heat. 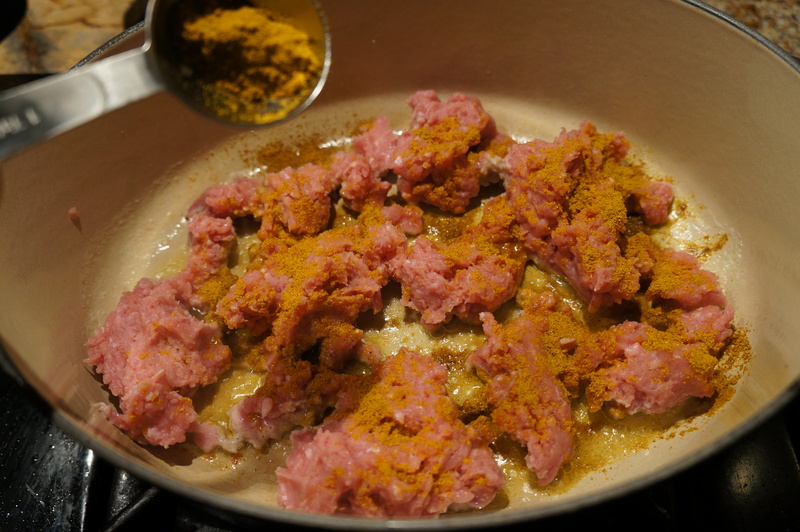 Add the turkey, 1 1/2 tablespoon curry powder and salt. Let it sit for a minute without disturbing it so the turkey can really brown. Cook stirring occasionally until turkey is cooked through and browned, about 5-8 minutes. Transfer to a bowl and add peas in with the cooked turkey to get them to start warming through. Heat the remaining butter in the pan over medium heat and add onions, cardamom, cloves, cinnamon stick and salt. Once the onions starting giving off liquid it should be easy to use that to deglaze the pan a bit, don’t be shy about scraping up the good brown turkey bits. 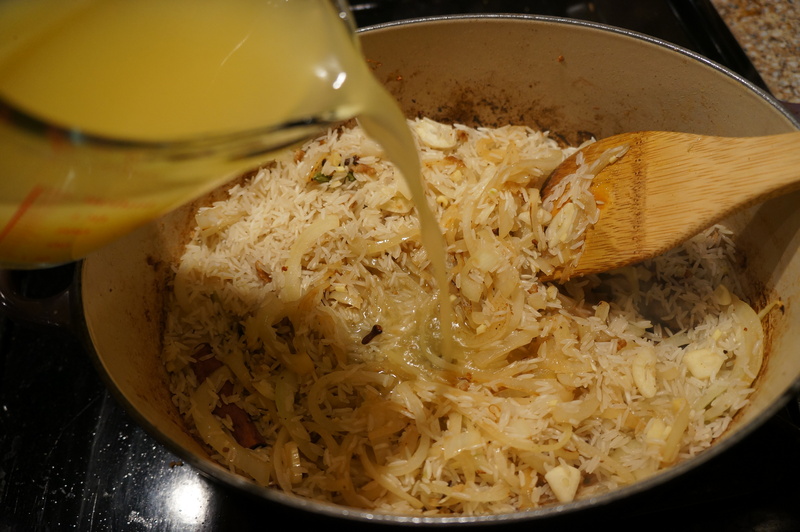 Stir and cook until onion begins to brown, then add the garlic and ginger. Cook for a minute, being careful not to burn the garlic. Then add the rice and remaining tablespoon of curry powder. 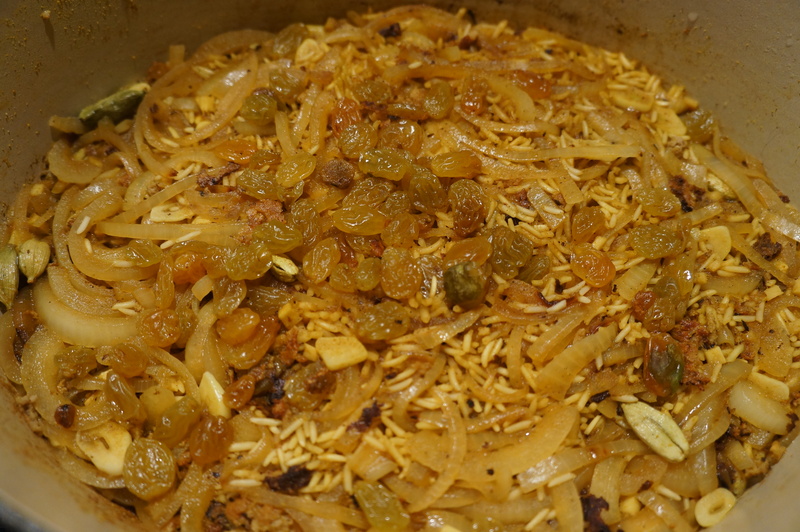 Stir to coat the rice, then add the broth and raisins and bring to a simmer. Turn the heat down to low, cover and cook until rice is tender and most of the liquid is absorbed, about 15 minutes. Scoop out the cinnamon stick, cardamom pods and cloves (the cloves can be hard to find so if you don’t get them all no worries, the will break down a bit with cooking) then stir in the turkey and peas. Let cook for a minute more to let the flavors meld and then stir in the cashews before serving. Note – the cashews are a nice crunchy, nutty addition but definitely not necessary. I cannot keep cashews in my house longer than a couple of hours before I snack on all of them so I usually skip it. The original recipe also uses cilantro but after years of living with a cilantro hater I left that out by habit but it does add a nice green touch. Made this again tonight. Great for freezing. I made this, it was yummy and the cardamom leaves a lovely fragrance in your kitchen. Used 3/4 cup of rice instead. I made this last night with cilantro. Great favors but it came out a little too dry. So need to be careful to leave some liquid when cooking the rice. so glad you tried it! Yea the rice can be tricky – the amount of liquid the vegtables and turkey give off can vary as can the amount needed for the rice you are using. You could bring the amount up to 2 cups for 1 cup rice which is the standard ratio and then cook off any excess liquid if needed. Can’t wait to have Kevin make this for me. 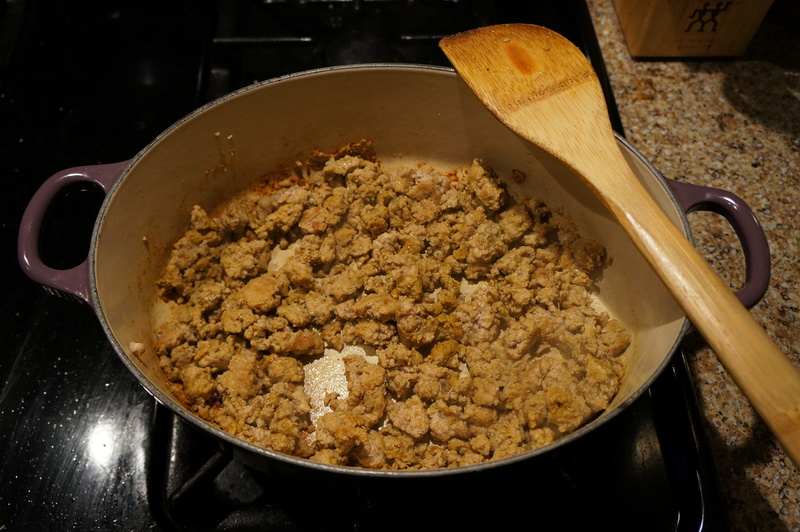 Always trying to figure out what to do with ground turkey!